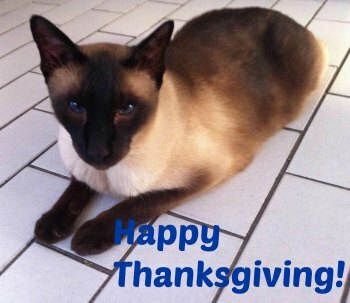 Welcome to November's Meezer Musings! Yesterday, Thursday, was Thanksgiving in the United States, so to all our American friends we hope you're having a happy and peaceful holiday weekend. I like the idea of Thanksgiving; it's not something that's celebrated here in the UK, except amongst Americans. Our churches have harvest festivals and suppers but they're not quite the same thing, and I enjoy the thought of a predominantly secular holiday in which to look back at the past year with our family around us, and celebrate whatever the year has brought us. So, in the lovely tradition of giving thanks for our blessings, Bandit is currently thankful for hot water bottles, cosy 'nests' and blankets and any little morsels of turkey that might just fall on the kitchen floor! And I'm thankful for Bandit, and the fact that he's still with us after what's been a sometimes difficult year for him. Siamese cats, as most of us know all too well, are generally talkative creatures and some of them have very loud voices. Which is one of the reasons we all love them - right? Recently, though, I've had several questions from people who've rescued or adopted Siamese cats or kittens without much of a 'Siamese voice', wanting to know if this was abnormal or unusual? No, it's definitely not abnormal. It is a little unusual, but not all Siamese cats are loud, or, for that matter, boisterous, even though they have a reputation for being so. Kittens learn so much from their mothers and siblings, including how to make a loud noise when they want to get their own way (!) that, if a kitten has, for whatever reason, not had that early socialization and learning they may end up not developing their voices at all. Of course, with any new cat it's always worth getting a vet to check it over if you're worried about anything at all, just to make sure there's nothing physically wrong. But I sometimes think that someone with a quiet Siamese in the house has a lot to be thankful for! I was reminded of this the other night when I took Bandit out for his nightly walk. He likes to stroll around the back garden and the front driveway to have a sniff around and see what other cats have been in the area (and then spray the offending bushes himself) and I generally take him out in his harness in the evening before we go to bed. We were outside the kitchen door and Bandit was telling me in his loudest and most strident Siamese voice that "no, he didn't want to go that way, he wanted to go this way, and by the way did I know that there was another cat around here somewhere?" when the (new) next door neighbor opened her kitchen door and said to someone behind her ... "did you hear THAT?" As there's a fence between us and the next door house, and she couldn't see us, I had to say over the fence to her ... "don't worry, it's just my cat". And then felt I had to qualify this by adding "he's Siamese", as if that explained everything. I expect I'm now known as the 'crazy cat lady next door'! In another email I received, one of our readers, Jeanne, wrote to me after September's newsletter in which I listed the reasons why Siamese cats may end up in rescues, to make the very good point that an additional reason for homeless Siamese may be that some people can't cope with living with the sometimes very loud and strident Siamese voices. "The reason, near as I can piece together from comments? Her VOICE. People are put off by her full Siamese voice. They think she's angry when she's just talking to them. So now when I talk to people who meet her, I explain that's just how Siamese sound. She's asking where I've been and wants to have a conversation about her day." It's sad that some people will turn down a cat because of their voice but it's probably understandable and far better that the cat should go to someone who likes and enjoys the huge range of noises that a Siamese cat makes. A constant and perturbed yowl when we're in the car on the way to the vet (he always knows). This rises both in volume and pitch to an angry yelling when the vet tries to do something to him that he doesn't like - oh yes, everyone knows him at the vets! And recently, since I've been taking him out on the harness at night, I've discovered an addition to his vocabulary - an extraordinary growling. I'm not really sure what this means; it sounds like a warning of some sort but is unlike any other sound he makes. I also frequently have to explain to people on the phone that no, I don't have a baby in the house, it's just Bandit wanting attention or supper! "I don't have an awful lot of stories to tell as of yet, as we haven't had him that long, but in the meantime I thought you might like a little video clip I made of him in slow motion. Some nice close ups on those incredible Siamese eyes, tiny paws and sandpaper like tongue! He's an applehead Siamese kitten that likes to play fetch, talk about everything and sleep on your face." We haven't had a video before, so I thought it would be fun to show one. Crooks is beautiful, has the most amazing set of whiskers and enjoys Dreamies! Thanks for sharing Crooks with us, Rob. 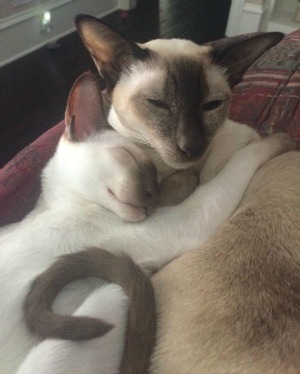 A hugely popular photo from our Facebook page this month was this one of Denise Carrera's kitten Coco and older cat, Gracie in a beautiful, peaceful display of Meezer love. Gracie was quite ill for a while a few weeks ago, but thanks to wonderful care from Denise and her vet she's doing well now. Well, that's it from us for this year - there's no newsletter in December as we hope you'll all be busy enjoying the festive season and the holidays with your loved ones and Meezers beside you. We'll be back though, at the end of January and in the meantime, if you've missed any of this year's newsletters and would like to catch up, there are links to each of them below. Wishing everyone happy and peaceful holidays - whichever ones you celebrate, and however you'll be celebrating them!